She observed him from her chosen cover, as she'd done twice before. The first two times he'd been chopping wood, but today, after a heavy snowfall appropriate for the third week of December, he was shoveling the sidewalk. Today was the day she'd take him. Heart in her mouth, she watched as he cleared the snow with carefully controlled violence. Every movement was exactly the same as the one before. Each slide of the shovel was strictly parallel to previous marks. And in his fierce control, she saw his rage, tamped and contained by will alone — like a pipe bomb. Flattening herself and breathing lightly so he wouldn't see her, she considered how she would do it. From behind, she thought, as fast as possible, to give him no time to react. One quick movement and it would all be over — if she didn't lose her courage, as she had the first two times. Something told her that it had to be today, that she wouldn't get a fourth opportunity. He was wary and disciplined — and if he weren't so angry, surely his senses,werewolf sharp, would have discovered her hiding place in the snow beneath the fir trees lining his front yard. She shook with the stress of what she planned. Ambush. Weak and cowardly, but it was the only way she could take him. And it needed to be done, because it was only a matter of time before he lost the control that kept him shoveling to a steady beat while the wolf raged inside him. And when his control failed, people would die. Dangerous. He could be so fast. If she screwed this up, he could kill her. She had to trust that her own werewolf reflexes were up to this. It needed to be done. Resolution gave her strength. It would be today. Charles heard the SUV, but he didn't look up. He'd turned off his cell and continued to ignore the cool voice of his father in his head until it went away. There was no one who lived near him on the snow-packed mountain road — so the SUV was just the next step in his father's determination to make him toe the line. It was a new wolf, Robert, sent here to the Aspen Creek Pack by his own Alpha because of his lack of control. Sometimes the Marrok could help; other times he just had to clean up the mess. If Robert couldn't learn discipline, it would probably be Charles's job to dispose of him. If Robert didn't learn manners, the disposal job wouldn't bother Charles as much as it should. That Bran had sent Robert to deliver his message told Charles just how furious his da was. “Chief!” The man didn't even bother getting out of the car. There weren't many people Charles extended the privilegeof calling him anything but his given name, and this pup wasn't one of them. Charles stopped shoveling and looked at the other wolf, let him see just what he was messing with. The man lost his grin, paled, and dropped his eyes instantly, his heart making the big blood vessel in his neck throb with sudden fear. Charles felt petty. And he resented it, resented his pettiness and the roiling anger that caused it. Inside him Brother Wolf smelled Robert's weakness and liked it. The stress of defying the Marrok, his Alpha, had left Brother Wolf wanting blood. Robert's would do. Charles didn't say anything. Let the fool work for it. He lowered his eyelids and watched the man squirm some more. The scent of his fear pleased Brother Wolf — and made Charles feel a little sick at the same time. Usually, he and Brother Wolf were in better harmony — or maybe the real problem was that he wanted to kill someone, too. “Tell him I'll come after my walk is cleared.” And he went back to work. After a few scrapes of his shovel, he heard the SUV turn around in the narrow road. The vehicle spun out, then grabbed traction and headed back to the Marrok's, fishtailing with Robert's urgent desire to get away. Brother Wolf was smugly satisfied; Charles tried not to be. Charles knew he shouldn't bait his father by defying his orders — especially not in front of a wolf who needed guidance as Robert did. But Charles needed the time. He had to be in better control of himself before he faced the Marrok again. He needed real control that would allow him to lay out his argument logically and explain why the Marrok was wrongheaded — instead of simply bashing heads with him the way they had the last four times Charles had spoken to him. Not for the first time, he wished for a more facile tongue. His brother could sometimes change the Marrok's mind — but he never had. This time, Charles knew his father was wrong. And now he'd worked himself up into a fine mood. He focused on the snow and took a deep breath of cold air — and something heavy landed on his shoulders, dropping him facedown in the snow. Sharp teeth and a warm mouth touched his neck and were gone as quickly as the weight that had dropped him. Without moving, he opened his eyes to slits, and from the corner of his eye, he glanced at the sky-eyed black wolf facing him warily . . . with a tail that waved tentatively and paws that danced in the snow, claws extending and retracting like a cat's with nervous excitement. And it was as though something clicked inside Brother Wolf, turning off the roiling anger that had been churning in Charles's gut for the past couple of weeks. The relief of that was enough to drop his head back into the snow. Only with her, only ever with her, did Brother Wolf settle down wholly. And a few weeks were not enough time to get used to the miracle of it — or to keep him from being too stupid to ask for her help. Which was why she'd planned this ambush, of course. When he was up to it, he'd explain to her how dangerous it was for her to attack him without warning. Though Brother Wolf had apparently known exactly who it was who'd attacked: he'd let them be taken down in the snow. The cold felt good against his face. The frozen stuff squeaked under her paws, and she made an anxious sound, proof that she hadn't noticed when he'd looked at her. Her nose was cold as it touched his ear and he steeled himself not to react. Playing dead with his face buried in the snow, his smile was free to grow. The cold nose retreated, and he waited for it to come back within reach, his body limp and lifeless. She pawed at him, and he let his body rock — but when she nipped his backside, he couldn't help but jerk away with a sharp sound. Faking dead was useless after that, so he rolled over and rose to a crouch. She got out of reach quickly and turned back to look at him. He knew that she couldn't read anything in his face. He knew it. He had too much practice controlling all of his expressions. But she saw something that had her dropping her front half down to a crouch and loosening her lower jaw in a wolfish grin — a universal invitation to play. He rolled forward, and she took off with a yip of excitement. They wrestled all over the front yard — making a mess of his carefully tended walk and turning the pristine snow into a battleground of foot-and-body prints. He stayed human to even the odds, because Brother Wolf outweighed her by sixty or eighty pounds and his human form was almost her weight. She didn't use her claws or teeth against his vulnerable skin. He laughed at her mock growls when she got him down and went for his stomach — then laughed again at the icy nose she shoved under his coat and shirt, more ticklish than any fingers in the sensitive spots on the sides of his belly. He was careful never to pin her down, never to hurt her, even by accident. That she'd risk this was a statement of trust that warmed him immensely — but he never let Brother Wolf forget that she didn't know them well and had more reason than most to fear him and what he was: male and dominant and wolf. He heard the car drive up. He could have stopped their play, but Brother Wolf had no desire to take up a real battle yet. So he grabbed her hind foot and tugged it as he rolled out of reach of gleaming fangs. And he ignored the rich scent of his father's anger — a scent that faded abruptly. Anna was oblivious to his father's presence. Bran could do that, fade into the shadows as if he were just another man and not the Marrok. All of her attention was on Charles — and it made Brother Wolf preen that even the Marrok was second to them in her attentions. It worried the man because, untrained to use her wolf senses, someday she might not notice some danger that would get her killed. Brother Wolf was sure that they could protect her and shook off Charles's worry, dragging him back into the joy of play. He heard his father sigh and strip out of his clothing as Anna made a run for it and Charles chased her all the way around the house. She used the trees in the back as barriers to keep him at bay when he got too close. Her four clawed feet gave her more traction than his boots did, and she could get around the trees faster. At last he chased her out of the trees, and she bolted back around the house with him hot on her trail. She rounded the corner to the front yard and froze at the sight of his father in wolf shape, waiting for them. It was all Charles could do to not keep going through her like a running back. As it was, he took her legs right out from under her as he changed his run into a slide. Before he could check to see if she was okay, a silver missile was on him and the whole fight changed abruptly. Charles had been mostly in control of the action when it was just he and Anna, but with the addition of his father, he was forced to an earnest application of muscle, speed, and brain to keep the two wolves, black and silver, from making him eat snow. At last he lay flat on his back, with Anna on his legs and his father's fangs touching the sides of his throat in mock threat. The words were more than just an end to play. He'd tried. But in the end, the Alpha's word was law. Whatever followed would follow. So he submitted as easily as any pup in the pack to his father's dominance. The Marrok lifted his head and removed himself from Charles's chest. He sneezed and shook off snow as Charles sat up and pulled his legs out from under Anna. “Thanks,” he told her, and she gave him a happy grin. He gathered up the clothes from the hood of his father's car and opened the door to the house. Anna bounced into the living room and trotted down the hall to the bedroom. He tossed his father's clothes into the bathroom, and when his father followed them, shut the door behind the white-tipped tail. He had hot chocolate and soup ready when his father emerged, his face flushed with the effort of the change, his eyes hazel and human once more. He and his da didn't look much alike. Charles took after his Salish mother and Bran was Welsh through and through, with sandy hair and prominent features that usually wore a deceptively earnest expression, which was currently nowhere in evidence. Despite the play, Bran didn't look particularly happy. Charles didn't bother trying to talk. He had nothing to say anyway. His grandfather had told him once that he tried too hard to move trees when a wiser man would walk around them. His grandfather had been a medicine man and talked like that sometimes. And he was usually right. He handed his da a cup of hot chocolate. “Your wife called me last night.” Bran's voice was gruff. “Ah.” He hadn't known that. Anna must have done it while he'd been out trying to outrun his frustrations. Tactful, that's me, thought Charles, who decided sipping his cocoa was better than opening his mouth. “And I asked him if you were in the habit of arguing with him without a good reason,” said Anna breezily as she slipped by his father and brushed against Charles. She was wearing his favorite brown sweater. On her it hung halfway down her thighs and buried her shape in cocoa-colored wool. Brother Wolf liked it when she wore his clothes. She should have looked like a refugee, but somehow she didn't. The color turned her skin to porcelain and brought out rich highlights in her light brown hair. It also emphasized her freckles — which he adored. She hopped up on the counter and purred happily as she snagged the cocoa he'd made for her. “And then she hung up,” said his father in disgruntled tones. “Mmm,” said Anna. Charles couldn't tell if she was responding to the hot chocolate or his father. “And she refused to pick up the phone when I called back.” His father wasn't pleased. Not so comfortable having someone around who doesn't instantly obey you, old man? Charles thought — just as his father met his eye. Bran's sudden laugh told Charles that his da wasn't really upset. “No fun fighting someone who doesn't fight back,” Charles said. She hadn't reached even a quarter of a century yet, they hadn't been mated a full month — and she was already arranging them all to suit herself. Brother Wolf was pleased with the mate he'd found for them. Charles set down his cup and folded his arms over his chest. He knew he looked intimidating, that was his intention. But when Anna leaned away from him, just a little, he dropped his arms and hooked his thumbs in his jeans and made his shoulders relax. “He stopped that,” Bran said coolly. “Please,” Charles snapped, “don't mouth something you don't believe to me — It smells perilously close to a lie. The Beast was forced to stop killing openly, but a tiger doesn't change his stripes. He's still doing it. You know it as well as I do.” He could have pointed out other things — Jean had a taste for human flesh, the younger the better. But Anna had already experienced what happened when a wolf turned monstrous. 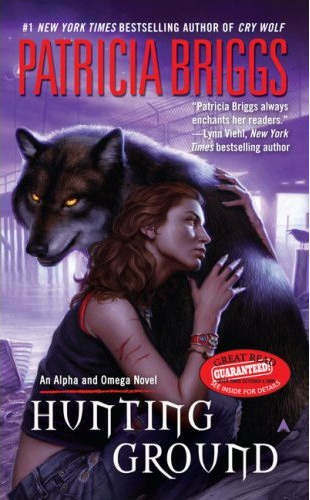 He didn't want to be the one to tell her that there were worse beasts out there than her former Alpha and his mate. His father knew what Jean Chastel was. He was right. Take the Beast out of the picture, and it still made him ill to think of his father going. The Beast was the most obvious, provable danger. “I just know,” Charles said, finally. “But it is your decision to make.” His gut clenched in anticipation of just how bad it was going to be. “No.” Charles forced his body to accept his defeat and kept his eyes on the floor. Anna was looking at his da with bright expectancy. Relief flooded Charles with an abruptness that had him leaning against the countertop in sudden weakness, as the all-consuming sense of absolute and utter disaster slid away and left him whole. Charles looked at his mate. She looked lost, but his Da laughed. He'd known the old man, too. Anna cleared her throat pointedly. “I love Seattle.” Krissy folded her arms around herself and spun in a circle. She looked up with a practiced little-girl grin, and her lover smiled down at her. “Work before play,” said Hannah, the spoilsport. She'd been Ivan's playmate before Krissy. Krissy had taken her place in his bed and in his heart, and it made Hannah pissy. It was raining again, but Jody had been raised in Eugene, where it only rained once a year — from January to December.Besides he was a Pisces; water was his element. He raised his face and let the rain wash down it. Practice had run a little late and the sun had set before he'd gotten out. The music had been good tonight, they'd all felt it. He pulled the sticks out of his back pocket and beat the air in a rhythm only he could hear. There was something he should change in that last measure . . . He took the shortcut to his apartment — a dim little street barely wide enough for a car and a half. It wasn't late, but there was no one around except for an older man and a girl who looked about sixteen. They were both drenched and hurried toward him. “Excuse me,” said the man, “We're visiting and seem to have gotten turned around. Do you know where the nearest restaurant is?” The coat he wore was expensive'wool, Jody thought, and he had a bright gold watch on his wrist that looked like it cost a bundle. The girl — as they got closer he was pretty sure that there was more than a generation between the old gent and the girl, maybe she was his granddaughter — was wearing four-inch heels that made her feet look tiny. She caught him looking and enjoyed his admiration. He couldn't help but smile back. She put her hand on his wrist, and said, “We need to find some food.” And her smile widened a little more, and he saw fangs. Strange, he thought, she didn't look like she belonged in the groups his ex-girlfriend had hung out with, where they all wore fangs and played that stupid game . . . not D&D, which was cool . . . something with vampires. This girl wore a ponytail and looked more like Britney Spears than Vampirella. Her shoes were hot pink, and there wasn't a piece of her clothing that was black. He didn't like it that his throat tightened in fear because she was wearing acrylic fangs. “No,” breathed the man, who had somehow gotten behind him while Jody had been talking to the girl. “Not funny at all.” And there was a sharp pain in his neck. And Jody led his new friends a few miles away to a place on the Sound where he knew no one would come. Jody was scared for a very, very long time before they threw him into the water for the fish to eat. “The rocks will keep him underwater until they won't be able to tell how he died,” said Ivan.